Liverpool full-back Trent Alexander-Arnold says Liverpool have come a long way under the guidance of Jurgen Klopp – and he believes this is shown by their last three results. According to the 20-year-old, in previous seasons, the Reds would not have been able to pick up three wins in games against Burnley, Bayern Munich and then Fulham in the space of eight days. 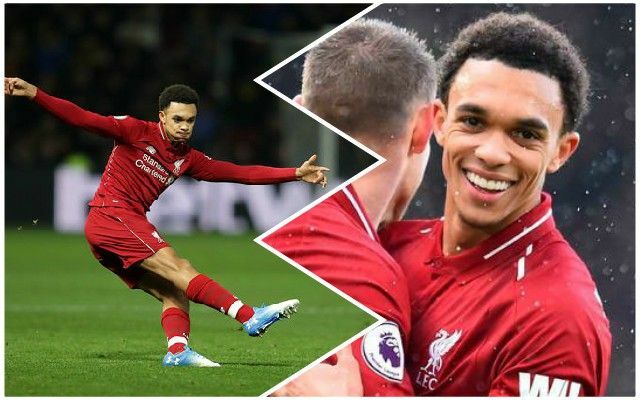 Having conceded a poor goal at Craven Cottage through errors from James Milner, then Virgil van Dijk and Alisson, for Ryan Babel to equalise, it would have been easy for the players to feel sorry for themselves, but that was far from the case, as Trent explained. He said, via LiverpoolFC.com: “Maybe a few years ago we would not have got the three points, but we’ve showed how good a team we’re becoming. We’re a force to be reckoned with. To kick on again and get themselves ahead in the Fulham game after conceding the equaliser showed great character. That is a mark of a good team, who are clearly coping with the title race pressure. Trent added: “The full week – the goals we have conceded at home to Burnley when we went down at home, it was tough going to Bayern, and then conceding a late equaliser against Fulham – was tough. With seven more league matches to go once the international break is over, there are plenty more tests to come, but the Reds have put themselves in a good position to finish the season on the highest of highs.